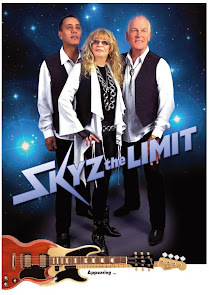 Margaret Britt, Micheal Derwin and Jon Kirk form SKYZ THE LIMIT TRIO. You will be blown away by the vocal and instrumental virtuosity of Margaret, Micheal and Jon as they take you through Rhythm and Blues, Rock, Soul, Reggae, Latin, Country, Swing and many more, ranging from the 50s through to present day. Margaret Britt - Multi Mo Award winner Margaret Britt is an extremely versatile and accomplished musician/entertainer (lead guitar, bass guitar, harmonica and vocals). Margaret formed the first Australian female group “THE VAMPS” and achieved international success. The Vamps were included in the Real Wild Child exhibition at Sydney’s Powerhouse Museum and the Australian Archives for Vietnam. On returning home from the US in 1977 Margaret formed “Peaches”, Australia’s first all girl vocal and instrumental group to have a number one hit record with their single “Substitute”. Margaret used to live in Bathurst and played at all the local venues in the early part of her career before she went overseas. Micheal Derwin - Micheal is an accomplished performer who can present a wide variety of musical styles from Rock to Latin and everything in between. His musical versatility and wide experience enable him to present vocal and instrumental solos as well as back up vocals. Over the last ten years Micheal has toured and performed extensively overseas. Jon Kirk - Jon Kirk, from St Louis, USA, is a man of many talents, playing bass and rhythm guitar, harmonica and drums. His outstanding vocal ability and range means that he can sing across a range of styles, including soul, rhythm and blues, ballads and country. Jon has toured overseas extensively throughout his career. Jon is also a multi Ace Award winner and Mo Award Nominee having performed with his Country Group Buckshot. Bookings - contact the band HERE.